T-R PHOTO BY MIKE DONAHEY Pictured is a portion of the Iowa River Trail near the intersection of West Nevada Street and 12th Street in Marshalltown recently. TRAILS, Inc. a local not-for-profit group, has been working for several years raising funds for the project, a 34-mile, paved multi-purpose trail which, when complete, will run from Marshalltown to Steamboat Rock. On Tuesday, the Marshall County Board of Supervisors approved submitting a letter of support for completion a trail master plan. 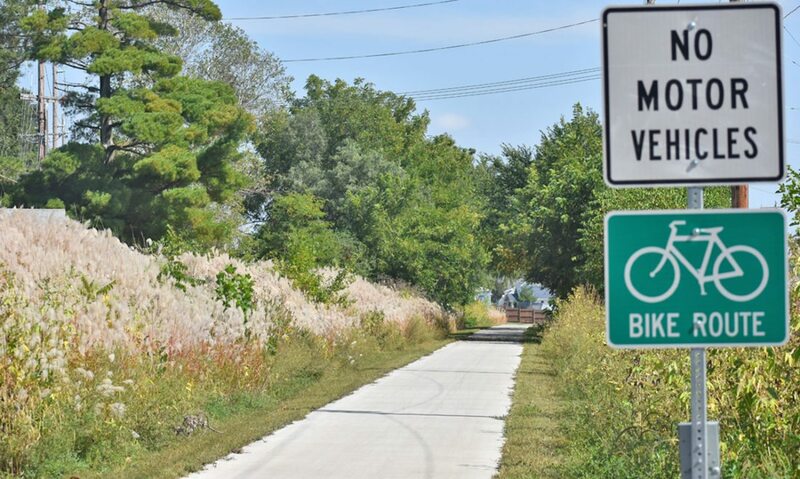 One of the prominent projects happening in the Marshalltown area is the Iowa River Trail bike path, and Marshalltown City Administrator Jessica Kinser asked for the written support of the Marshall County Board of Supervisors to pursue a grant Tuesday morning. The grant in question is being offered by the National Endowment for the Arts for developing a master plan for a trail. That plan could include signature bridges, placemaking, signage, aesthetics, amenities and other design recommendations. An application is due by Oct. 2. Board Vice President Dave Thompson was not warm to the idea of approving a letter of support from the county. He said those types of things should be the city’s priority. “I kind of have to question a few priorities; are we going to take care of our critical infrastructure needs, or are our priorities arts and signage for the bike path?” Thompson said. He was the “no” vote in a 2-1 decision to submit a letter of support for the completion of a master plan for the trail. “I want to be sure that, if we do a letter of support, I want to say there’s no financial thing tied to that … now or in the future,” Board President Bill Patten said ahead of the vote. Also approved Tuesday was the county’s property and casualty insurance. The total amount authorized for the insurance was $327,683.50 and combined Shomo-Madsen Insurance EMC, Shomo-Madsen Insurance IMWCA for workman’s compensation and cyber errors and omissions insurance. After its first year in business, Buzzed Bee Meadery Inc. of Melbourne got a renewal of their Class C Native Wine license from the county. The renewal came with living quarters, outdoor service and Sunday sales privileges. Also approved was a change order proposal for the Marshall County Courthouse elevator upgrade project from Hay Construction Services. The installment of a fire sprinkler in the north elevator hoist way pit was approved in the amount of $2,410. The action also allowed for five days to be added to the final project work schedule. The next Marshalltown Board of Supervisors meeting is set for 9 a.m. Oct. 3 in meeting room no. 2 on the third floor of the Marshall County Courthouse, 1 E. Main St.